West Oakland is one step closer to getting its first full-service grocery store in a decade. As KQED reported last year, Brahm Ahmadi has been trying to buy land since 2014 in West Oakland -- a food desert that has also become a more expensive place to live than it used to be. Ahmadi's efforts to build People’s Community Market were stalled as land prices shot up. Now an anonymous investor and a well-known nonprofit developer have stepped up to help Ahmadi complete a deal that will allow him to build a market near the San Pablo corridor. “While the primary focus is on access to good food, there’s also a really big focus on community-building,” says Ahmadi, who envisions a grocery store that would also act as a community gathering space. Getting this far has been a struggle for Ahmadi, and his story demonstrates the challenges of getting a deal like this done in Oakland. Ahmadi has received help from East Bay Asian Local Development Corp., a well-known nonprofit developer in Oakland, which has helped Ahmadi search for a location for People’s Community Market and has even negotiated deals with landowners, he says. Still, it was hard to get a deal done. What hasn't helped was the elimination of state redevelopment money, which was once used for infrastructure and other projects, like Ahmadi's, in neighborhoods that needed it the most. That has left a giant hole to fill in financing projects that are meant to uplift certain neighborhoods. “Working with angel investors and creative foundations and alternative funding sources that take a social equity approach to their investment decisions is a critical piece of this,” says Simon. Ahmadi eventually met an Oakland native who was willing to help. 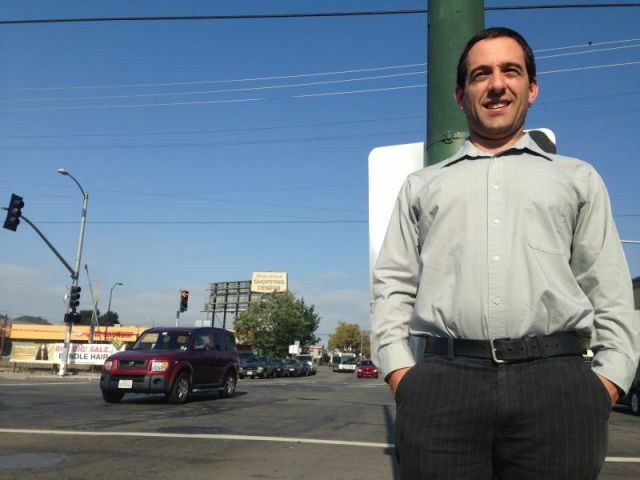 Ahmadi won’t name his investor but says he owns several commercial properties in Oakland. “He just believes in this project and in the need in the community,” says Ahmadi. The investor has loaned EBALDC $970,000 so that the nonprofit can purchase the property at 3103 Myrtle St. in the San Pablo corridor. EBALDC will then give People’s Community Market a 30-year lease with little rent, says Ahmadi. Another, perhaps more complicated, deal was struck with St. Matthew Missionary Baptist Church, which is adjacent to where the store will be built. The historic black church has been in West Oakland since the mid-1950s. And it’s not for sale, says church financial secretary Altheria Jinks. Gentrification and displacement of longtime Oakland residents is a common conversation at the church, Jinks says. It’s also a conversation that she needed to have with Ahmadi before agreeing to any deals with him, she says. “I had the discussion with Brahm when they first came to us with that offer. I just feel like a lot of areas in Oakland are seeing gentrification,” she says. Ahmadi says he understands the church’s concerns, which is why he would show up on Sundays without “the suits” (his lawyer and broker) before even talking about specific details of the deal, he says. “We knew step one for us was absolutely about trust building,” says Ahmadi. The church has agreed to lease its parking lot to People’s Community Market. Ahmadi says he plans on making improvements like new pavement and lighting. The lease with the church includes a provision in which a certain number of parking spaces are reserved for the church on Sunday mornings, Wednesday and Friday evenings, four Sunday afternoons a year and up to four funerals per year. Jinks says the grocery store could also have a positive impact on the greater community, perhaps bringing new members to the aging church, or at least help clean up an area that has seen plenty of drugs and crime. The neighborhood has been starved of investment. That was a major concern Ahmadi had last year when considering whether to even try and develop a grocery store in that part of the city. The city has also been concerned about the crime, blight and drug use in the area -- specifically a small triangle park, St. Andrew's Plaza, which the city has closed and plans to renovate. Once open, Ahmadi hopes People’s Community Market will improve community health and community-building. He envisions the store having a social hall with its own separate entrance that could be a venue for guest speakers, workshops and community activities. By evening, it could be an event space for live music, poetry readings and recreation, he says. There will be a nonprofit arm to the grocery store that will run programs on nutrition and health education, Ahmadi says. The long-term goal would be to create technology that can track customers’ health and to help them monitor what they’re buying and give recommendations and rewards toward achieving healthy outcomes, he says. But first Ahmadi has to raise even more cash. The store, which he plans to open in late 2017, still needs between $4.5 million to $5.5 million for construction costs. Plus, he plans to raise an additional $800,000 for operating costs after the store opens, through a direct public offering.